My work is cross disciplinary but my grounding is in sound. It's immensely present in my work: in the ways in which I think about time, in my examinations of language and use of text, even in the way (really the "where") in which I put things on the wall when building installations: Cagean silence, granular synthesis, and the construction of meaning through sequenced objects in space. 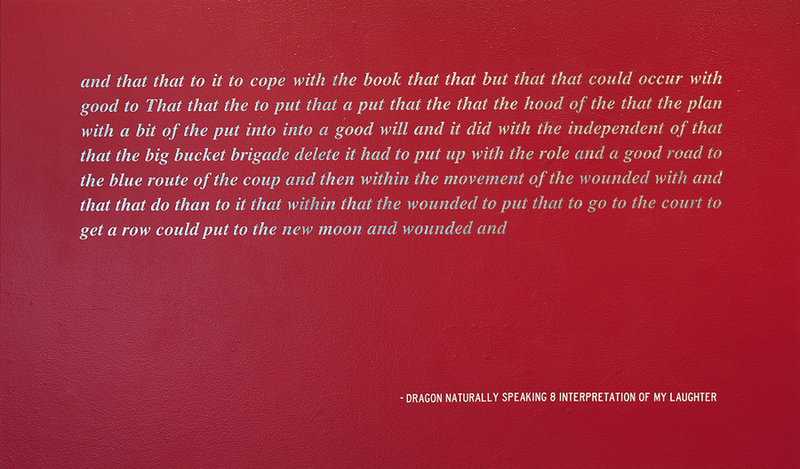 Paint, text, laser cut vinyl on gallery wall. 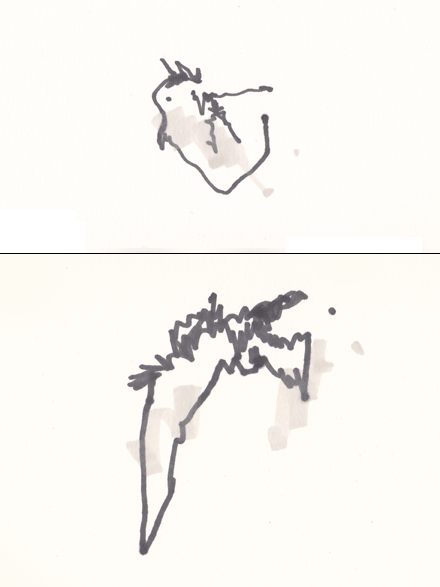 2011.
above left: ll the Love that's in-between. 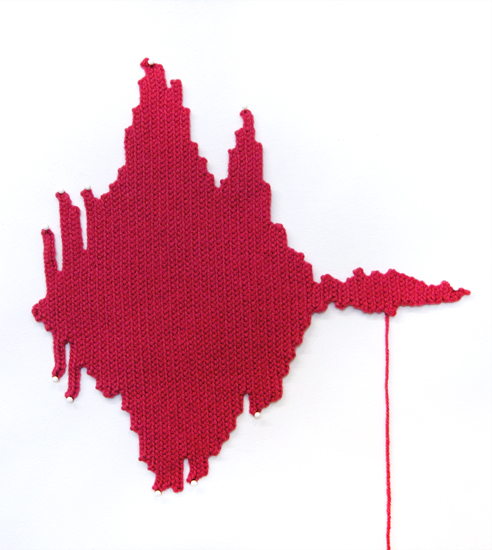 One of a series of 9 crocheted waveforms made from acrylic "Red Heart" brand yarn of various people saying the word "Love" . Sources range from friends to historical figures and icons of popular media (Moses from the Ten Commandments). Each of the waveforms is made from a different color of yarn. Dimensions variable, approx. 12" x 3" x 1/4" each. 2004. 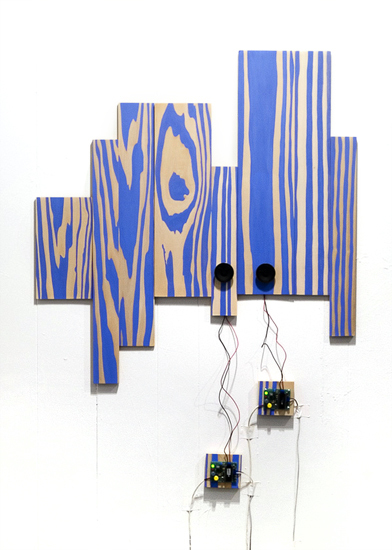 Painted wood, speakers, motion detectors, pre-recorded sound chips. 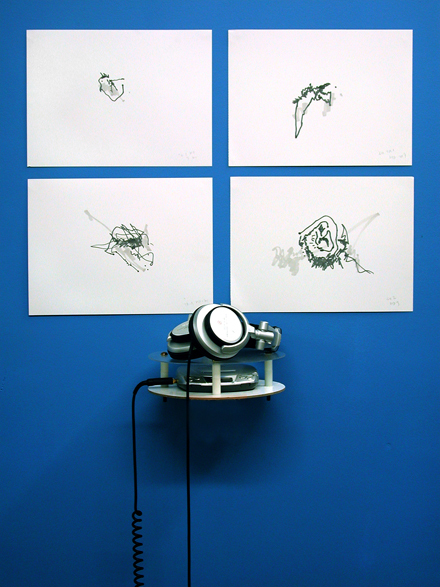 The motion of visitors through a room triggered the playback of multiple sounds: of highly processed human speech and of the sounds of creaking trees. In the original installation the walls of the room were covered in fake wood paneling, painted white. Dimensions variable; at least 8'(w) x 8'(h) x 8(d)'. 2005.